Tony Blair has faced a wave of resignations by junior members of his government over his refusal to name a date for resignation as Labour leader. He branded ex-junior minister Tom Watson, the most senior person to quit, "disloyal, discourteous and wrong" for signing a letter urging him to go. The resignations came as Mr Blair faces growing pressure to name a departure date or even quit now. Gordon Brown's backers say assurances he will resign in May are "not enough". But Mr Blair's supporters claim the calls for him to quit are an orchestrated plot by supporters of Mr Brown, who has so far declined to comment on the furore. Analysis: Can Blair hang on? In a statement, former Home Secretary David Blunkett said: "It is now in Gordon Brown's - and the Labour Party's - best interests for those seeking the prime minister's immediate departure to back off. "This is not only to avoid our opponents exploiting the impression of disintegration and division, but also to avoid the split of our party, which would have lasting consequences. "No-one can benefit from a split in the government or the party now, or in the foreseeable future, and this is patently avoidable by a return to common sense." Mr Watson and the six parliamentary private secretaries (PPSs) - who are unpaid ministerial aides at the bottom rung of the government ladder - were among a number of normally loyal Labour MPs from the 2001 intake who signed a letter calling on Mr Blair to quit. The six were: Khalid Mahmood, Wayne David, Ian Lucas, Mark Tami, Chris Mole and David Wright. In a joint statement, four of the PPS group said Mr Blair had "not ended the uncertainty over when you intend to leave office, which is damaging the government and the party". Mr David told BBC Radio 5 Live he was worried about next year's elections in Scotland and Wales, adding: "We obviously will do much better if we have a clear timetable set out for transition". Mr Watson, who has already been replaced as a junior defence minister by junior transport minister Derek Twigg, said he no longer believed that it was in the best interests of the party or the country for Mr Blair to continue. 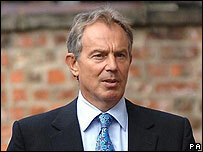 But Mr Blair hit back saying that calls for his resignation were putting Labour's electoral prospects at risk. He said he had been "intending to dismiss" Mr Watson anyway "but wanted to extend to him the courtesy of speaking to him first". The prime minister added: "Had he come to me privately and expressed his view about the leadership, that would have been one thing. "But to sign a round robin letter which was then leaked to the press was disloyal, discourteous and wrong. "It would therefore have been impossible for him to remain in government." The Sun newspaper said earlier that Mr Blair will go on 31 May, but Number 10 has insisted it had not leaked the date. Meanwhile, leading Brownites are calling for the prime minister to make a public declaration about when he will go, so that he cannot go back on it. If this is a coup, are Brown's allies ready to follow through? One of the chancellor's closest allies, who asked not to be named, told the BBC News website: "From Gordon's point of view there has to be a public statement. "Blair has to let it be known when he will go and there has to be a public declaration." Ex-minister Doug Henderson, also a Brown supporter, said he could not see what Mr Blair would achieve by staying on. "There should be a new leader in place by the end of March," said Mr Henderson, in time for the local elections and mid-term polls in Scotland and Wales. "People in the country want a change," he added. Conservative leader David Cameron said the government was "in meltdown", while Lib Dem leader Sir Menzies Campbell added that Mr Blair "should either resign or state a date".